Sophsterlicious • UK Blog: - Bliss 'No Zit Sherlock' Rubberizing Mask. Time for another Bliss Mask post today. This time the No Zit Sherlock.. (Hah! See what they did there?). This mask intrigued me because it is a rubberizing mask, and it is made for spot and blemish prone skin .. That's my skin! Boost your blemish-battling regimen with this straight-from-our-spa facial treatment, a weekly must for pimple-prone skin. The unique rubber texture is designed to envelop skin’s surface to absorb impurities and allow the mask’s key ingredients to be optimally absorbed by the skin. Plus, it’s packed with pore-de-clogging, oil-absorbing, super-soothing extracts and nourishing, detoxifying seaweed. So if you’re looking for a clean, clear, shine-free complexion—‘mask’, and you shall receive! Includes 6 individually wrapped mix-it-yourself masks, 6 spatulas and measuring scoop. .. 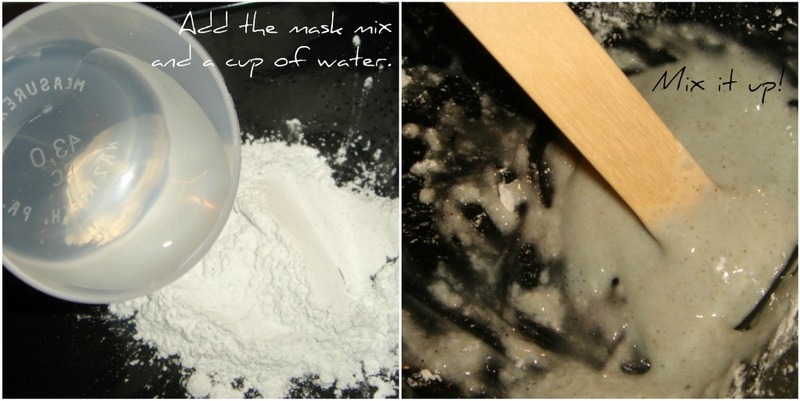 So, it says on the box to mix a whole sachet of the mask with a cup of water, then mix it up. *Warning* This will make way, way to much mask. I luckily found this out before, so use half a sachet, and half a cup of water. That gives you enough to cover your face, and best of all, you will get 12 masks instead of 6! It makes it much more worth the money, because this kit is quite pricey at £35. Once you have mixed it up you need to slap it on to your face as quickly as possible because it thickens up quickly and obviously, when it is set, it rubberizes. It is quite a thick consistency that instantly soothes the skin and has a distinct smell of tea tree to me. I showed the process on my hand as I couldn't get any decent pictures of it on my face, before or after (apart from the silly one at the end of this post.) So, it takes about 15 to 20 mins to rubberize and then you just peel it off. The thin edges which are unavoidable (as seen below) go a little crisp feeling and are a little harder to remove, but warm water does it. My skin after using the mask felt lovely and smooth and I even noticed that it looked refreshed. I had a few pimples when I used this, and the next morning they had all but dried up, this didn't dry my skin out at all though. I just followed up with a moisturiser. I would totally recommend this mask if you have spot prone skin and are looking for something that's a bit different. Don't forget, you will get 12 uses instead of 6 if you use half a sachet per use. It's fun to use and does the trick. One final note, if you have any left over, throw it in the bin and not down the sink as it'll rubberize and clog the sink! I like your site with super nice design and interesting posts. I will definitely add your site to my Link list.